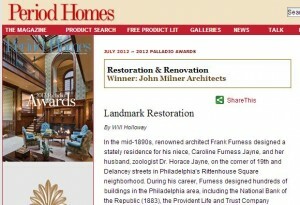 Restoration & Renovation project award – Somerset Door & Column Co. The 11th annual Palladio Awards competition has recognized nine architectural firms for outstanding work in traditional design for commercial, institutional, public and residential projects. 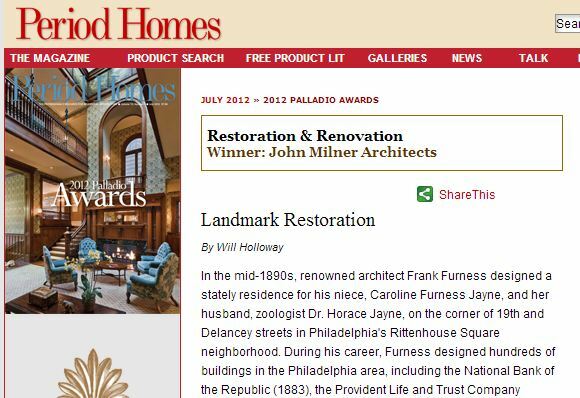 Winner for the residential work Restoration & Renovation category is John Milner Architects, Chadds Ford, PA, for the Jayne House, Philadelphia, PA. Somerset Door & Column Co. manufactured doors for this project. The Palladio Awards program is co-produced by Traditional Building and Period Homes magazines and is named in honor of Andrea Palladio, the Renaissance architect who created modern architecture for his time while drawing on past models for inspiration. Somerset Door & Column Company is a premier manufacturer of architectural wood columns and pilasters, fiberglass columns and pilasters, StaveCast™columns and pilasters, decorative capitals, porch posts, custom doors, fine wood entryways and accompanying millwork. Click here to read local news story.